Oh Sinnerman, where you gonna run to? Sinnerman, where you gonna run to? This past April I received an email from a longtime friend of mine letting me know that Papa had died. It was a shock for both of us, since we knew Papa for years. I guess he was almost sixty, or so, and had some kind of cancer. A majestic portal in our lives was closed shut. The last time I saw him, Eileen and I were walking through downtown Belgrade, where we all lived. Already divorced from Mira, leaning on his girlfriend as if his life depended on it, Papa looked absent, displaced in another dimension. The girlfriend was a typical bottom feeder, glancing at three of us sideways, not even trying to act friendly. Wherever Papa was, he tried to return by cracking a few empty jokes. It was a sad sight: he always had an exquisite sense of humor, and we used to repeat his ‘pearls’ for days to come. In front of me emerged another man, his instincts were taking a toll larger than him. Standing still in the middle of a busy district, we communicated like strangers with familiar faces. I didn’t act much better either, being freshly married and sensitive to Eileen’s reactions. If someone had to paint the scene, I would had gone with Toulouse-Lautrec much rather than Rembrandt – it was that painful in detail. I met Papa some time in 1976, as he lived five stories above my friend’s apartment. He was a natural-born painter, a bohemian par excellence. Never met a woman he didn’t like, despite being married to Mira and having two boys, Philip and Mark. Other than that, he was a caring husband and affectionate father. Working as a janitor didn’t bother him a bit: he was people’s person in the truest sense of the word, liberated from socially condescending formulas. On the other end of the spectrum, he showed too much respect to those with high education: couldn’t resist paying the price for his own insufficiency there; which further led to a certain self-denial – his talent just couldn’t offset this poison. Papa’s paintings were surrealistic, closer to Ernst in ‘Celebes’ than any Dali. My favorite was a head close up of man bursting at the seams of sheer power, a dog collar with metal spikes around his neck. None of us who surrounded him on daily basis figured it out, but it’s clear to me now, after Papa is gone: that was his autoportrait, where the utmost vulnerability met the extreme aptitude and raw instinct. Papa presented us with the painted quintessence of him, yet we acted as a consortium of mentally blind men. Not once, we’d take a bus and ride out of the city to pick up his paycheck, then roll back to our favorite pub and get hammered, orderly (one scotch, one bourbon, one beer). We’d sit there, mano a mano, and dig deep into life, art, metaphysics, and even deeper, down the bottle. It’s amazing how many epiphanies you can extract from thick glass freshly washed by hard liquor. For the most of our circle, Papa was an entertainer: five-eight, lean and full of muscle, he was bursting with life; his thick blond beard and discolored teeth added to visual part of the package. He either had a wide smile on his face, or his eyes would be piercing through you with friendly attention. As for me, he was both an inspiration and support: natural motivator and mood lifter, Papa would build for you an aura around otherwise average day, person, or event. His electrifying vigor would transform reality in front of your very eyes, making you feel a special participant of a unique happening. Papa supported me on different levels, the most memorable being the girls he hooked me up with. And he was so subtle along the way, that later I could barely remember whose courtesy it was. In essence, he treated me as a champ long after I quit racing, led me believe I still was, and kept my dream intact. How many people are willing, or able to do that? You tell me. Eventually, we all morph into the later phase, following dialectics down the road obscure to us at the time. Eileen and I got married, Mira and Papa got divorced, I jumped into my taxicab and took on driving ten hours a day; and before you wiped the glasses, the picture exhausted its appeal. I have no intention of becoming a structuralist here – a person who looks at Vermeer and says: ‘Nice frame’ – but the composition lost its balance. The thrill was gone, and so was our camaraderie. There is an uneasy aftertaste in my mouth every time I part a friend and have to reshape my inner texture, a taste of emotional hangover, a self-query if the new path earned its marks, or just erased a perfectly sound direction. Some doubts always remain doubts, and there’s nothing I can do about it. In 1990 we moved to the U.S., and memory hell broke loose: time, now multiplied by distance, turned into a voracious white shark, feasting on anterior relationships and images like there was no tomorrow, nor yesterday. The first new world impressions cut deep into the fresh soil of our expectations: life was future weighted, taking no prisoners from the obsolete wars. From the opposing end, I had to face the fact that Serbs, by definition of time, live in the past. Even though they gave up on rain dance years ago, communion via internet is random at best, having the shock value of Colonel Buendia’s, when his father took him to see ice. * How can anyone explain to Mark and Philip Cosović what happened in front of their eyes during that short week. I certainly can’t. Maybe The Poet, in the boiler room named Romeo and Juliet? 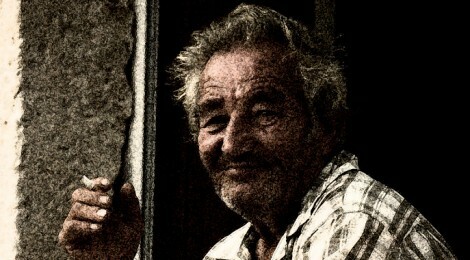 Image adapted from: Flickr, “Croatian Old Man” by username: joão ornelas (joão ornelas), under the Attribution-NonCommercial-ShareAlike 2.0 Generic license. George Djuric flew through rally racing, street fighting, philosophy, and anti-psychiatry as if they weren’t there. In the aftermath, all that was left was writing. He published a critically acclaimed collection of short stories, a book read like the gospel by his Yugoslav peers, The Metaphysical Stories. Djuric is infatuated with the fictional alchemy that is thick as amber and capable of indelibly inscribing on the face of the 21st century literature. He lives in the desert near Palm Springs, CA, USA.